Serious shoppers know that Malaysia is one of the best shopping destinations in Asia. Glitzy malls, department stores, markets, the city offers a veritable treasure trove of goods for people who love to shop. If you are planning a shopping holiday in Kuala Lumpur, you should probably aim to base yourself at the city center, an area known as the Golden Triangle, the city’s entertainment, business and shopping hub which is bordered by three main streets Jalan Imbi, Bukit Bintang and Jalan Sultan Ismail. Located here are some of Kuala Lumpur’s most luxurious hotels, office towers and glamorous shopping malls that offer abundant fashion, food and entertainment options. Currently, KL’s ritziest mall, the Pavilion hosts outposts fashion’s biggest names like Celine, Louis Vuitton, Bottega Veneta, Bulgari, Gucci and many more. Coupled with several food outlets, coffee shops, bakeries and a ginormous food court at its lower level, the Pavilion is a premier shopping destination located at the epicenter of Bukit Bintang. An added attraction at this towering mall, is its stunning centerpiece a Liuli Crystal fountain, the tallest in Malaysia. The swish environs of the Star Hill Gallery host some of fashion’s most exclusive names Kenzo, Valentino, Missoni, Alexander McQueen, all have a presence at this luxe enclave. The mall which lies adjacent to sumptuous hotels like the J.W. Marriott and the Ritz Carlton, hosts various dining options like Shiok, Spice of India, Enak KL, Sentidos, Luk Yu Tea House which have most global cuisines covered. An established player on KL’s shopping scene, Lot 10 has for years been a firm favorite with the young and the young at heart. Lot 10 hosts several popular trendy and affordable brands like Zara, H&M, along with more up market names like Zang Toi, Braun Buffel and Birkenstock. Also located within the mall is city’s the flagship National Geographic store and a truly unique food court, Lot 10 Hutong which hosts some of most well regarded the family-run eateries in Malaysia. If you love or are even curious about Malaysian cuisine, you can’t afford to miss out on Lot 10. Yet another mall aimed at the young and trendy, Farheneit88 offers various fashion-forward brands like Uniqlo, Parkamaya, Swag, Tropicana Life along with various lifestyle, dining and entertainment outlets. Considered to be a haven for fashion mavericks on a budget, the gargantuan Sungei Wang Plaza is home to more than 500 small stores that sell a wide array of products like luggage and leather goods, footwear, on trend apparel for all the family, costume and real jewelry, beauty supplies, gifts, toys, eyewear, electronics and cell phones, sportswear and much more. The mall also hosts an outpost of the popular Malaysian department store Parkson and organizes a multitude of entertainment and fashion events along with product launches and fairs. The mall also offers a Sungei Wang Tourist Privelege Card for tourists, which give visitors access to rebates at participating retailers. So if you plan to shop till you drop at Sungei Wang Plaza, make sure that you pick up your privilege card at the mall’s information counter. If you love gizmos and gadgets, then Plaza Low Yat located on Jalan Bukit Bintang is just the spot for you. Offering the best prices for cameras, digital games, cell phones, laptops, computers and peripherals and various other IT lifestyle products, the seven floors of this mall are always buzzing with activity. 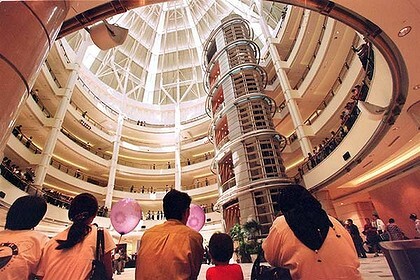 Situated at the base of the magnificent Petronas Towers, the Suria KLCC mall is popular with both tourists and locals. The store composition of the Suria KLCC mall features a good mix of luxury and mid-market local and international brands like Marc Jacobs, Kate Spade, Miu Miu, Aseana, Marks and Spencer’s, Gap along with various food and beverage outlets like cafes, restaurants and food courts. The mall also hosts a variety of entertainment options like an aquarium, a lush green park and a cinema. Suria KLCC also offers a tourist privilege card which offers visitors access to wide-ranging discounts at various outlets. Berjaya Times Square is the biggest mall in Kuala Lumpur. In addition to over six hundred stores, this mall also hosts a hotel and a ride-filled theme park making it a perfect location for families vacationing with children. KL’s malls are not just limited to the city’s epicenter and the city also hosts malls in its many residential neighborhoods. The Mid-Valley Mega Mall is located between Kuala Lumpur and Petaling Jaya, and is located close to KL Sentral, a major transport hub of KL. The Mid-Valley Mega mall offers more than 430 shops and food outlets that cater to all tastes and budgets. Within the Mid-Valley Mega mall, is a smaller, more compact mall-The Gardens which hosts several luxury good retail outlets along with department stores like Singapore’s Robinsons and Japan’s Isetan that are its anchor tenants. The Gardens has an entire a floor dedicated to spa and wellness services. So if you are looking for some pampering on your shopping expeditions, the Gardens Mall is an ideal shopping locale for you. The Bangsar Village Mall is located on Telawi Street, an upmarket residential enclave that lies between Petaling Jaya and Kuala Lumpur. This mall is made up of two main sections- Bangsar Village 1 and II, both of which host a wide array of shopping, dining, lifestyle and leisure outlets that cater to all ages, tastes and budgets.